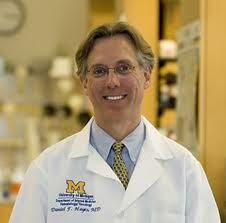 Dr. Hayes is the Stuart A. Padnos Professor of Breast Cancer Research and co-Director of the Breast Oncology Program at the University of Michigan Comprehensive Cancer Center. He has a long history of clinical and translational breast cancer research regarding new drug development/clinical trials and particularly development and clinical utility of biomarkers. Dr. Hayes has been principally responsible for introduction and adoption of several circulating tumor markers, including CA15-3(which identifies MUC-1 protein), extracellular domain of HER2, and more recently enumeration and characterization of circulating tumor cells (CTC). He has also been a leader in tissue-based markers of prognosis and prediction to therapies, such as neo-vascularization, HER-2, and the 21-gene recurrence score. He and his colleagues in the Consortium on Breast Cancer Pharmacogenomics (COBRA) have made sentinel discoveries regarding the effects of inherited, germline, genet single nucleotide polymorphisms on metabolism and clinical activity of endocrine treatments of breast cancer, such as tamoxifen and the aromatase inhibitors. Over the last two decades, Dr. Hayes’ professional training and career have been directed toward bridging the gap between laboratory and clinical research. He received a bachelor’s degree (1974) in biology and a master’s degree (1977) in biochemistry at Indiana University. He received his M.D. from the Indiana University School of Medicine in 1979, followed by a residency in internal medicine at the University of Texas Health Science Center at Dallas, Texas (Parkland Memorial and affiliated hospitals). He served a fellowship in medical oncology from 1982–1985 at Harvard’s Dana Farber Cancer Institute in Boston, where he subsequently distinguished himself on the faculty in regards to breast cancer research and care. In 1992, he assumed the role as the Medical Director of the Breast Evaluation Center at DFCI. He held that title until 1996, when he moved to Georgetown University and spent the succeeding five years establishing an enormously successful collaboration with Dr. Marc E. Lippman. In 2001, both Drs. Lippman and Hayes joined the University of Michigan Cancer Center to continue their fruitful relationship in the context of the existing translational science. Dr. Hayes has been influential in both clinical and laboratory studies of the diagnosis and treatment of breast cancer. Dr. Hayes and colleagues published the first reports concerning the development of the CA15-3 blood test, which is currently used world-wide to evaluate patients with breast cancer. He has become an internationally recognized leader in the use of this and other tumor markers, such as HER-2, circulating tumor cells and pharmacogenomics. Recently, he and his colleagues have reported ground breaking results regarding circulating tumor cells in metastatic breast cancer and regarding the pharmacogenomics of tamoxifen. He is widely considered to be an expert in the field of clinical research of breast cancer, especially in regards to new hormonal and chemotherapeutic treatments. He also lectures and publishes extensively regarding the management of patients with breast cancer. In 2007, he was awarded the American Society of Clinical Oncology’s Gianni Bonadonna Breast Cancer Award. Reflecting his expertise, Dr. Hayes has been Chair of the Solid Tumor Correlative Sciences Committee of the Cancer and Leukemia Group B (CALGB), one of the leading federally-funded multi-institutional cooperative groups that perform definitive clinical research in cancer care and he is now Chair of the Breast Cancer Translational Medicine Committee of the Southwest Oncology Group. He is Chair of the Correlative Sciences Committee of the U.S. Breast Cancer Intergroup, and he co-chairs the Expert Panel for Tumor Marker Practice Guidelines for the American Society of Clinical Oncology. He serves on the editorial boards of several leading cancer journals.